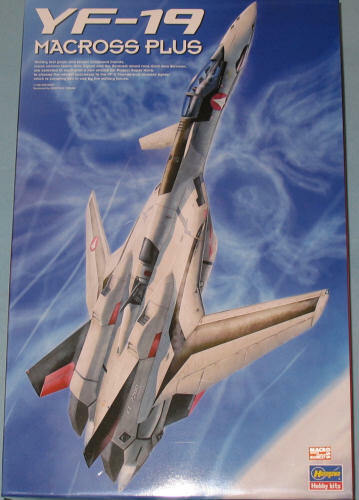 The YF-19 comes from a Japanese sequel to the original Macross Series known as Macross Plus. The VF-19 Excalibur is the production-line version of Shinsei Industries' YF-19 AVF Prototype which won the Project Super Nova design contest of 2040. Although destined to eventually replace the aging VF-11 Thunderbolt as the main variable fighter for the UN Spacy, distribution to date has been slow. Currently the Excalibur is being used as a fighter for UN Spacy colonization fleets. The rare VFs are usually only piloted by the best and brightest pilots, similar to the status enjoyed by the VF-17 Nightmare. The VF-19 will gradually phase out and replace the VF-11 as the main fighter of the UN Spacy. Three decades after the great war between the humans and the Zentradi the U.N. government is developing new technologies to use in their transforming fighter aircraft by running tests on the colony planet Eden. Military test pilots and former childhood friends, loose cannon Isamu Alva Dyson and the Zentradi mixed race Guld Goa Bowman, are selected to each pilot a new aircraft (Shinsei Industries' YF-19 & General Galaxy's YF-21 for Project Super Nova, to choose the newest successor to the VF-11 Thunderbolt variable fighter which is currently still in use by the UN Spacy military forces. Their own personal grudges end up disrupting the tests, and begin to wreak havoc on the program. I picked up this kit because I liked the “Macross” look of the YF-19 not because I’m a fan of the Macross sequel (I haven’t even seen it.) I did read somewhere that Hasegawa wants to expand beyond the aircraft that it is known for. 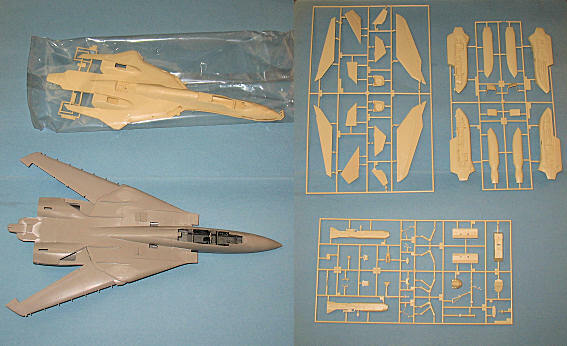 It is a typical Hasegawa kit with fine panel lines and nice details. Instead of the usual light grey plastic, the majority of the 181 parts comes in a yellowish tan on 6 sprues with a separate sprue of clear plastic for the canopy and other bits. The instructions are well done and contain a list of Gunze Creos paint that can be easily converted to other paints. The majority of the YF-19 is to be done in a lightened radome tan. 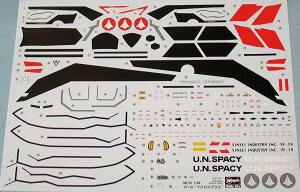 The decal sheet is later Hasegawa decals with white instead of ivory. The instructions give one the choice of decals or painting certain markings. I can not vouch for the accuracy as I’m not very knowledgeable about the subject, but it certainly fits the bill of something SF and out of the ordinary. This kit is part of the Hasegawa plan to expand beyond aircraft into other areas. I guess being a kid of the 1980s and who grew up with Robotech and other Japanese mecha anime it is no surprise that I have a weakness for these new Hasegawa kits. The YF-19 should be an interesting build.